If only Apia Harbour can tell her story of the last 150 years. We would be mesmerised with the drama and the dramatics of Samoan history played out in her waters. No one would move until she has finished telling her story. She would tell of the Samoan Crisis that played out in the 1880s and for the next 20 years. It was great drama between local Tafa’ifa factions as to who would be King of Samoa. Local might was aided by super power shelling of villages by warships in the search for the rightful king of Samoa. That crisis did in part facilitate the tearing apart of the Samoa Islands between the super powers. All was settled in the Tripartite Convention of 1899 in Berlin. And with three strokes of the pen in Berlin, Samoa was dissolved, made torn asunder forever and a day. Germany to take Upolu and Savaii, the United States Tutuila. Samoans had no say on the matter. That was the great drama of that period. A defining moment for Samoa which was almost played out in Apia Harbour 10 years earlier. Well, almost, but for the intervention of the Great Cyclone of March 1889 that destroyed U.S. and German warships in the harbour. Germany and America were ready to go to war with each other right here in Apia to gain supreme control of Samoa. There were 7 warships in the harbour from February through to mid-March 1889. Germany had three and the United States three. The 7th belonged to Great Britain, the HMS Calliope acting as the impartial party. Rightly so, for Britain was guaranteed possession of the Fiji Islands. Just when tensions were at an all-time high, a mighty cyclone blew for two days (16-17 March). The Great Cyclone would render apart the intentions of the super powers to settle the Samoan Question then. All six warships perished with a great loss of life in Apia Harbour. They were tossed like toys by her mighty waves. HMS Calliope alone survived. She managed to escape out to sea during the storm. USS Trenton was smashed against the shore then dragged out to sea where she splintered against the reef. USS Vandalia also suffered the same fate. USS Nispic was beached but was later refloated. Germany fared worst. The sight of the German SS Adler on her side in the aftermath was impressive. SMS Eber was picked up by the waves and smashed onto the reef where she perished and sank. SS Olga fared best of the German vessels. She was thrown on the shore where many of her crew managed to escape death. The wreckage of the Adler could be seen in Apia Harbour as late as the 1950s and 60s. As Samoa was recovering from the effects of the Great Hurricane a new visitor arrived, sailing through the harbour in search of a better place to live. Tusitala Robert Louis Stevenson had arrived. He played his part in our history then and still does to this day. Now that German Samoa was the official government of the land, old structures were dismantled. Samoan kings and authorities that did not buy-in to this new authority were exiled to various islands around the Pacific. From 1900 to 1910 ships sailed in and out of the harbour carrying Samoan leaders exiled overseas. Some would return, many did not. The great orator from Safotulafai Lauaki Namulauulu Mamoe is one that comes to mind. He was sailed out of Apia Harbour in 1909 for Saipan where he was exiled. When Germany’s rule ended with the onset of the First World War Namulau’ulu was set to return only to die enroute in 1915. The end of German occupation did not mean the end of exiles of Samoan leaders. The N.Z. Administration that took over employed much the same. It silenced the outspoken Olaf F Nelson in 1927 by exiling him to N.Z. for 5 years. Other movements in and out of the Harbour of History was the great people movement of Samoans to the mission fields of Papua New Guinea, New Hebrides (Vanuatu), Savage Islands (Niue), New Caledonia, Tuvalu, Kiribati and other places. There were hundreds and hundreds of missionaries that went to spread the Tala Lelei to far isles. Many of them did not return. Sad goodbyes were witnessed by the Harbour of History on a daily basis. Then that fateful day on 7 November 1918 when the SS Talune sailed through the harbour. The ship of death was carrying within it the Spanish Influenza. Bad decisions were made by the N.Z. Administration that saw affected passenger(s) offloaded. A short time later, a third of Samoa’s population was obliterated by the infection. If only she could talk, Apia Harbour would tell quite a tale of many more ships and vessels through her gates. None the right period to look back at what she saw than Independence week. This is the backdrop to the Independence Swim on Friday, 2nd June. 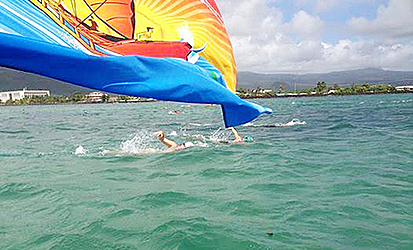 The first Independence Swim was in 2012 at the celebrations of 50th anniversary of independence. It was also the first Ocean Swim Samoa Events organised in Samoa. The swim takes you across the Harbour of History from Vaisigano in front of Sheraton Aggie Grey’s Hotel to finish 3kms away at Sails Restaurant in Mulinu’u. This is your opportunity to swim the Harbour of History. And when you sit down at Sails, or anywhere along the waterfront try and visualise what our Harbour has seen over the years.